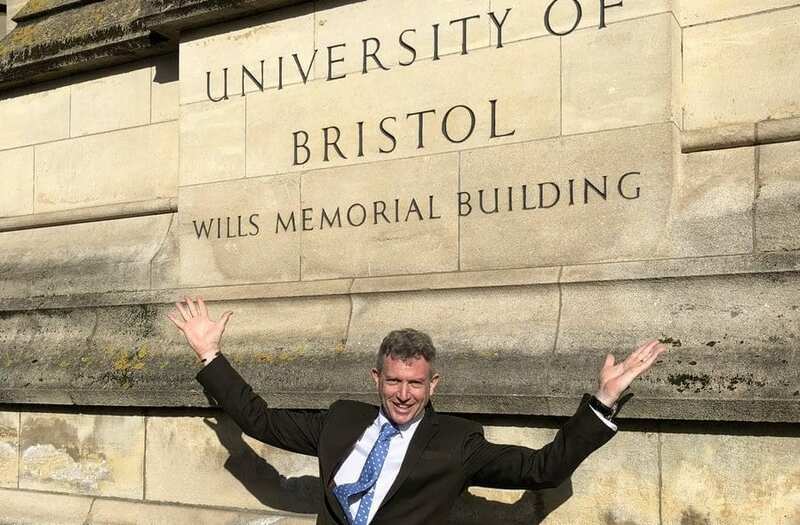 In February I was humbled to be conferred with an Honorary Doctorate by the Univeristy of Bristol. It was a surreal experience, getting robed up and entering the Great Hall to receive a degree exactly 30 years after I had first done so; and then giving a public lecture in the very building I attended lectures in, with my undergraduate textbooks and dreams. Some things have irreversibly changed: my 1980’s mullet, the Cold War, Apartheid and the revolutions that are the internet, smart phones, social media and reality TV. Other things haven’t, seemingly at all:- my childlike belief in a better future, the Queen as our head of state, Gary Lineker popping up on our screens every weekend, the dominance in the news of a wall built to divide people (albeit one then coming down and another now going up), and a seemingly un-ending and irresolvable fight over our relationship with Europe. And I stood there reflecting on where those 30 years had gone, how I could never have planned for where my life has taken me and how unlikely it all seems to be in a position to be honoured and humbled in this way. Being humbled, makes you feel small. I felt small because I was there in front of the people I love: my parents who never got the opportunity to go to university; my wife, who I met at this very university all those years ago, and my children who are now at the university stage of life, and who belong to a generation to whom all purpose in my life points. I also felt small because I was in front of the university itself, not just any university - but THE University of Bristol. With all its history of people who had been in that Great Hall and who led better lives because of what they learned -and learned about themselves - at Bristol. So, I felt small because all these people, and thousands more, known and unknown to me have influenced the opportunities in my life, have seeded ideas and taught me both compassion and ambition. And so, I have realised that my big learning in life - learnt between last leaving The Wills Memorial Building and now returning - is that it’s people that matter - and that they are pretty much the only thing that matters. Each young graduate in that Hall was capable of doing remarkable and extra-ordinary things in the years to come. But whatever brilliance that is within them - it can only get out, only have the impact it could have, only ever even be found - with the care, time, love, and selfless-ness of other people. To achieve anything we need each other. As an entrepreneur, people often say to me ‘oh you had such a great idea’, ‘your brand is spot on’, ‘the products are so innovative’, ‘it’s changed my life’ but I know that although the initial idea was wholly mine, its delivery relied on the energy, ideas, passion and hard work of others - and that without a team, without community and without the civic space that enables entrepreneurs to thrive - our roads, schools, safety, and NHS - and everyone who works within them - nothing would happen from a just great idea. This idea that we need each other, and we are connected - that we are all just human beings, each stumbling through life trying to do the best for our families and our communities - is real. As is the fact that we have the best chance of fulfilling our passions, our life’s purpose and of leaving a little legacy that says we were here, when we know we have more in common with each other and feel better about ourselves because of it. We can put ourselves in others’ shoes and understand that they too are stumbling through their life, trying to make the best of it for themselves and others. I absolutely believe that our tomorrows will be better than our yesterdays because the spirit of youth is full of optimism, collaboration and a can-do attitude and it is a university’s role to find, direct and amplify such a spirit. If a man in his fifties like me can claim that spirit of youth - as a state of mind rather than a stage of age - then as a member of that younger generation, I think that not only do universities have the ability to light passions and fires in young people’s bellies in the academic subjects that they study whilst in their care, but also they have the power to ignite each student’s zest for life, and their belief in their ability to question and then change things - for the betterment of the world around them, for nurturing that sense of togetherness, interconnectedness and of ‘more in common’. Especially in this volatile, uncertain, complex and ambiguous world where so much is designed to divide us. Universities hold the responsibility for forming the whole person in these young adults and the ability to forge them into true leaders of tomorrow. They are also one of the last institutions in our society that still retains the trust and credibility that they have always had in contributing to our communities and moving us forward. In such hands pass our future leaders and so also an opportunity to create a culture and environment to maximise inclusiveness of opinion, diversity of experience and create influence in shaping our society’s future. That is daunting, but I know - and I shared - that a university like Bristol is more than up to the task.